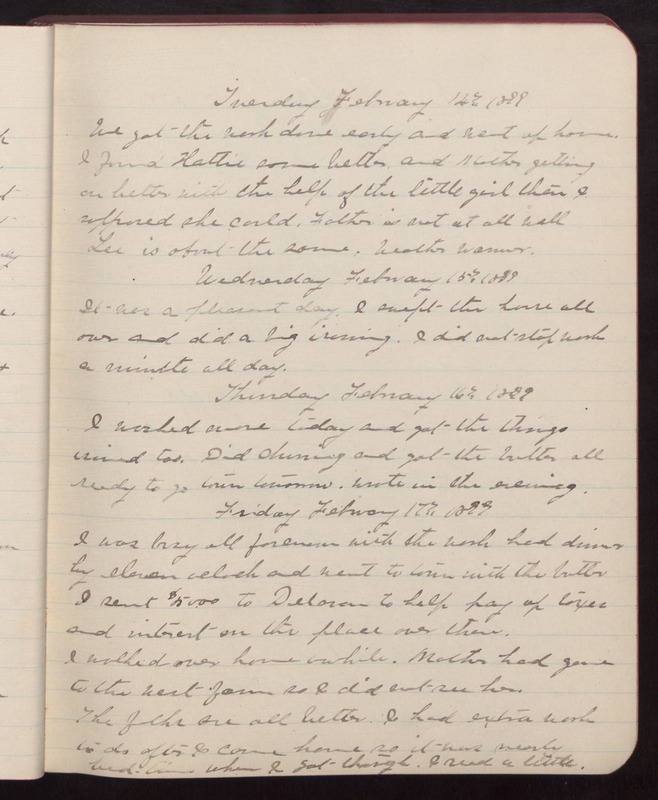 Tuesday February 14th 1899 We got the work done early and went up home. I found Hattie some better, and Mother getting on better with the help of the little girl than I supposed she could. Father is not at all well Lee is about the same. Weather warmer. Wednesday February 15th 1899 It was a pleasant day. I swept the house all over and did a big ironing. I did not stop work a minute all day. Thursday February 16th 1899 I washed more today and got the things ironed too. Did churning and got the butter all ready to go town tomorrow. Wrote in the evening. Friday 17th 1899 I was busy all forenoon with the work had dinner by eleven oclock and went to town with the butter I sent $50.00 to Delavan to help pay up taxes and interest on the place over there. I walked over home awhile. Mother had gone to the west farm so I did not see her. The folks are all better. I had extra work to do after I came home so it was nearly bed-time when I got through. I read a little.